Publisher's Summary: Galen is the prince of the Syrena, sent to land to find a girl he’s heard can communicate with fish. Emma is on vacation at the beach. When she runs into Galen—literally, ouch!—both teens sense a connection. But it will take several encounters, including a deadly one with a shark, for Galen to be convinced of Emma’s gifts. Now, if he can only convince Emma that she holds the key to his kingdom . . .
My Take: I was super excited to get my hands on a copy of Of Poseidon, and I couldn’t get to reading it fast enough! 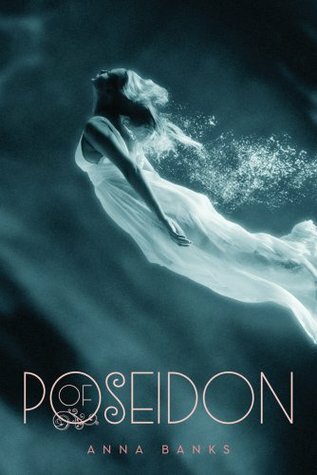 I wasn’t fully sure what I was getting myself into when I committed myself to reading Of Poseidon, I only knew that it had something to do with mermaids…and I was intrigued! Of Poseidon starts immediately with a scene that had me cracking up! We find the main character, Emma, in a face-to-face, extremely mortifying position (No, I won’t tell you…you’ll have to read it to see what I mean!) . . . and the best part is her friend in the background, who’s cracking jokes and making Emma even more embarrassed than she already is. The second chapter is just as good as the first, only now we find Emma in a scene that’s horrifying, not mortifying! So, basically, the first and second chapters set the tone for the remainder of the book. Each chapter switches back and forth between the POV of Emma and Galen, the prince of the Syrena. This switching between POV’s had me a little nervous in the beginning because I thought it would destroy any surprises and plot twists. However, even though we see the story from both POV’s, you’re definitely kept in suspense and don’t learn everything right away. I really loved every single character in this book…and I mean every single character; I really can’t think of one character that I didn’t like! And I liked each character in a totally different way…so much so that I really can’t even decide which character I liked the most! Of Poseidon is a magical story that includes a fun, cute romance. The story often had me laughing hysterically and, to top it all off, there’s an awesome twist in the end. The ending leaves the story open for another book or an entire series, but I’m content even with it being a standalone book! This is for sure a book I would totally recommend. I've been so excited about this one since seeing that gorgeous cover! Glad to hear it was fun and romantic and magical--everything I was hoping for! I wasn't sure about this one, Im not huge fanof mermaid stories. I usually spend most of the story wondering about the "mechanics" instead of the actual plot. But I've only heard positives about Of Poseidon, so I probably will read it when I get a chance. Nice review! This is a great review. I have been waiting for the release of this book and I cannot wait to read it. It seems so interesting. Your review especially makes me want to read it! Can't wait to read this one! It sounds so good! So far I haven't found a mermaid book that I like so I kind of dismissed this one. But you know what? This might be the one that I DO like so I'll have to give it a try! I think I'll wait and watch for it at the library though.